Tractor Supply Co. proposes to redevelop a portion of the former Meeks Lumber site at 2391 Nevada City Highway, according to a memo from Grass Valley City Hall. It includes a 18,800-square-foot retail store and 55 parking spaces. The proposal will be discussed at a Development Review Committee meeting on February 14. 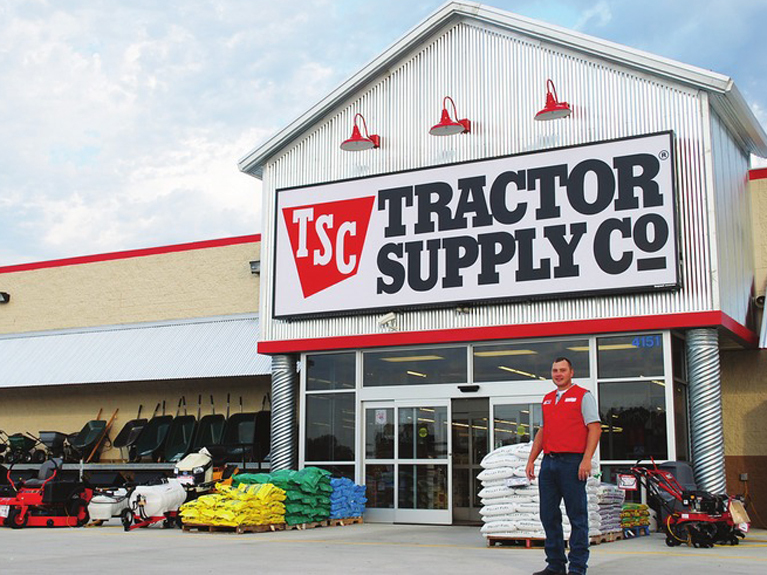 Tractor Supply Company is the largest operator of rural lifestyle retail stores in the United States, according to its website. The company operates over 1,600 retail stores in 49 states, employs more than 24,000 people and is headquartered in Brentwood, Tenn. Its stock is traded on the NASDAQ exchange under the symbol “TSCO”. Author jeffpellinePosted on February 11, 2017 February 11, 2017 Tags grass valley, Grass Valley City Hall, Grass Valley Development Review Committee, Meeks Lumber, Nevada City Highway, Tractor Supply Co.
Susanville has one if these stores. Mostly goods made in China, very sterile, doesn’t carry everything. It just can’t compare to some of the great old supply stores we knew as youngsters. Yes, Loomis has a great old supply store: Foothill Feed & Gift. Closer to home, Peaceful Valley Farm & Garden is superb. As for our demographics, we are going to draw Tractor Supply Co. and Dollar General, not Saks Fifth Avenue or Barneys. Ha! This is generating a lot of interest in “Peeps” and other forums on Facebook. The nearest one is in Yuba City. Sort of a cross between Hills Flat/B&C and Cabella’s and PetCo. Will also compete with every local feed store and water tank supplier and fencing company. Corporate profits Uber Alles.These types of stores are very efficient, at funneling money to the ultra wealthy, and maintaining universal serfdom for the rest of us peasants. But Tractor Supply is small fry. Time to nationalize Amazon dot Com. It’s a bloody utility at this point. At present, from NSJ with 49 closed, the Yuba City one is closer. Across 49 from Dutch Coffee in Auburn. Reminds me of the Dollar General of feed and hardware. Lot of oddball and mismatched merchandise obviously bought at closeouts but you probably won’t find what you’re looking for. I used to go to the TSC in Redmond Oregon, I liked that store and enjoyed being in there. Back in the late 1980s and 90s the Central Oregon TSC had a mix of the “real deal” farmers, ranchers and cowboys who still went to grange hall dances on Saturday nights, and the ranchette ranchers who moved to that area from out of state. I would guess a TSC around here would have a whole different feel to it reflecting a much different agriculture culture than Central Oregon back then. Steve, Thanks for sharing! Central Oregon in the ’80s? Did Bhagwan Shree Rajneesh ever show up at Tractor Store Company in his Rolls Royce? That was before my move to Oregon, but what a bizarre scene that Rajneeshpuram place was. They were quite a ways north of the Bend area in Wasco County along the Columbia River. I did know a few people who had done some construction work on the compound in the early days and said they got paid well. Oregon seems to have its share of crazies showing up, Bundy take over of the Malheur Wildlife Refuge being the most recent. Heaven’s Gate sucked in a bunch of people from the Waldport area on the coast. Then again when it comes to crazies and around here……. Well, it will be another terrible eyesore and another reason to leave this mixed-use county. Terrible idea and now the old buildings are down they can put anywhere USA right across from small offices and nearby neighborhoods, not happy! well its the much needed competition that ridge feed( aka simply country) needs! then maybe they will improve, how they treat there employees! and get the staff back to provide the once great customer service!that they seem to know longer worry about,as they have a monopaly!